Everyone's obsessed with adding a 3rd dimension to their 2-D art these days, from Tron stepping it up with a 3D re-release, to Step Up 3D -- though even five dimensions couldn't make up for its glaring lack of Tatum. 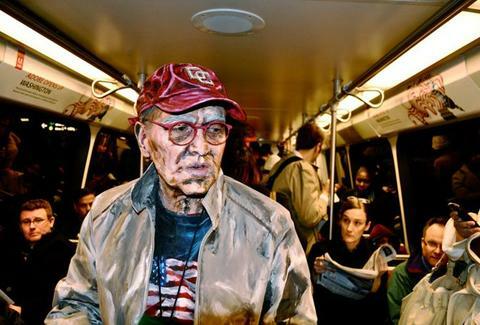 For an artist moving things in the opposite dimensional direction, check out Alexa Meade. Opening her first show Saturday, Meade's a DC-based, just-graduated experimentalist who photographs mind-blowingly painted, "acrylic on flesh" subjects -- real people brushed to look like paintings -- that "perceptually compress three-dimensional space into a two-dimensional plane", and as long as Ted Striker's not flying it over Macho Grande, everything should be all right. The paint's acrylic-based (though her secret-sauce formula involves ~15 other components), and the skin painting itself takes around two hours (though clothing takes considerably longer and is generally done the night before), and uses heavy, thick brushstrokes to create a Trompe-L'Oeil, French for "trick the eye", as opposed to "trick, the eye", a phrase shouted by deviants who get off on being stabbed in the cornea by hookers. Her first exhibition'll showcase recently lauded work like "Timmy on the Metro" (photos of a fully painted man on the rush-hour Red Line as confused commuters look on), as well as never-before seen newness from her residency like a portrait of a painted underpants-only man smoking a cigarette (capturing the actual smoke), and upside-down shots of a 70-year old woman lying on a hardwood floor, affirming that Meade's new-age art is at least conventional in its ability to make old people uncomfortable. Meade'll be live-painting a person at the opening (and for the next five Saturdays), and is also taking commissions for individual portraits -- and unless you somehow develop rock-hard abs and a nuanced appreciation for GI Joe's emotional state, it's about the only way to get into the pictures.